Heart Association – You Are Not Right and You Never Were! Is the recently released report from The American Heart Association true? They say, Coconut oil is high in saturated fats so we should avoid it. “Because coconut oil increases LDL cholesterol, a cause of CVD [cardiovascular disease], and has no known offsetting favorable effects, we advise against the use of coconut oil,” the American Heart Association said. Instead, The American Heart Association’s Dietary Fats and Cardiovascular Disease advised eating corn oil, soybean oil, peanut oil and canola oil. Over 90% of corn, canola and soy oil is genetically modified, and all four AHA recommended oils are highly processed and inflammatory. Why should this one “study” be surprising when the AHA website is loaded with unhealthy advice, recipes and tips that disregard mountains of evidence that humans need to avoid processed foods, industrially processed vegetable and seed oils and simply eat real food, like our ancestors ate. We need to eat healthy fats. Plenty of rebuttals have been written about the AHA opinion on coconut oil. Read the piece from GreenMedInfo.com if you want to understand the real science. Instead I want to call into question the nutrition advice that the AHA gives Americans. The American Heart Association has given certain foods the Heart-Check mark. Heart-Check certified foods make the list for questionable reasons. Why certify processed foods with harmful ingredients, inflammatory oils and MSG? Evidence #1 The Heart-Check Food Certification program (labels grocery store items as “heart healthy”). AHA says, “When you spot the American Heart Association’s Heart-Check mark, you’ll instantly know the food has been certified to meet our nutrition requirements. It’s a good first step in creating an overall sensible eating plan.” <—- FALSE! 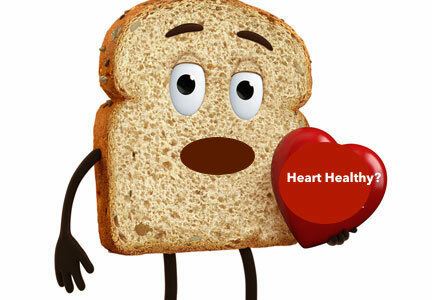 Pepperidge Farm Whole Grain Honey Wheat Bread (Soybean oil, Sugar, Trans Fats from monoglycerides). Take a look at the recipes that AHA has on their website. These recipes are not healthy, will raise your blood sugar, inflame your arteries and pack on the pounds. 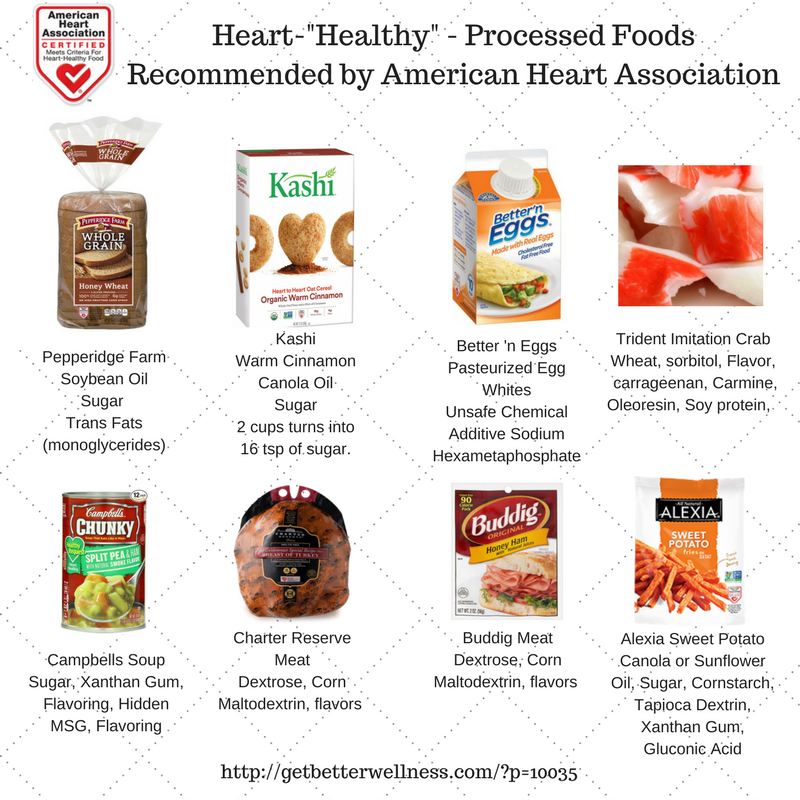 Many of the Heart Check processed food items that AHA approves have problem ingredients added. Many of the recipes have sugar and sweeteners added. The American Heart Association is not giving you heart healthy information. The nutrition advice is wrapped around highly processed foods that can spike the blood sugar and bring in chemical additives, sweeteners, trans fats and other inflammatory fats. Consider the AHA is a trade group and not an unbiased health-minded group. Sponsors get the nod and bad science rules. 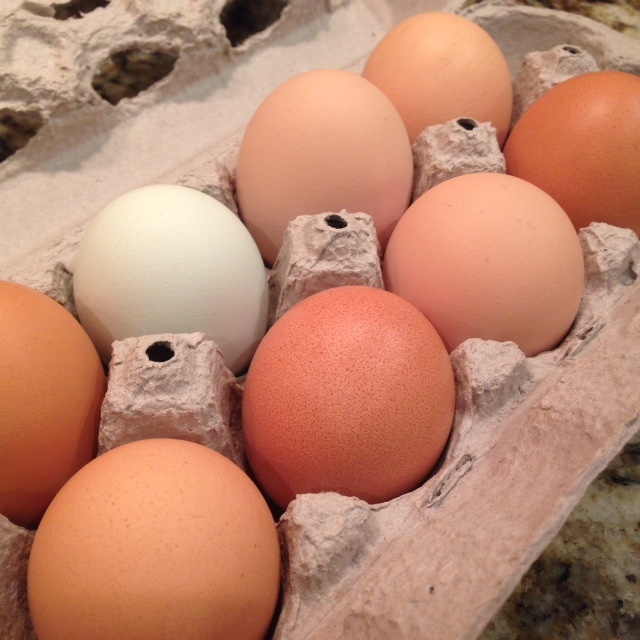 Instead, eat real food – unprocessed. Moderate amounts of healthy animal protein – from free-range, pasture-raised, grass-fed and finished animals. 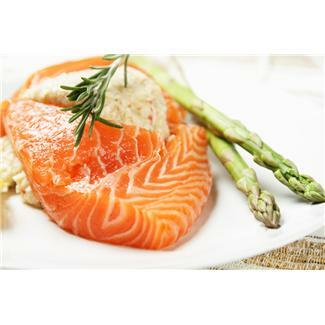 Enjoy wild caught fish, and leave the “imitation crab” that AHA recommends at the store. Eat loads of color vegetables – fresh or frozen, never canned. Eat whole fruit but avoid pasteurized juice which is too sugary and devoid of the nutrients found in fresh fruit. Eat healthy fats like grass-fed butter, unrefined coconut oil, olive oil, and avocado oil. 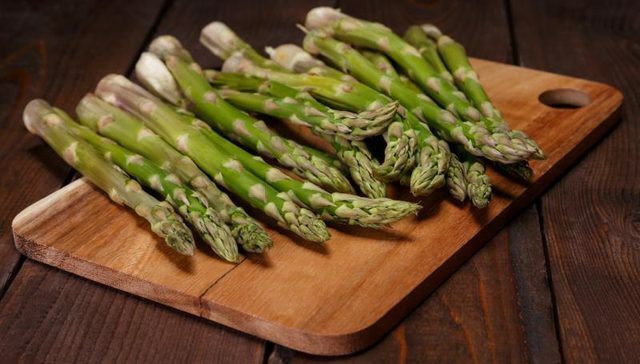 Enjoy fresh foods and cook at home. Soups and stews are great but watch out for canned and processed foods and the unwanted ingredients. Avoid the processed foods recommended by the AHA. Skip the bread, bagels, waffles, cereal, chips, pretzels, rice cakes, fat-free pudding, soy milk, margarine, graham crackers and rolls that the AHA website lists as good choices. Healthy eating – delicious unprocessed food – the way our ancestors have eaten and they way we need to eat if we are seeking health.